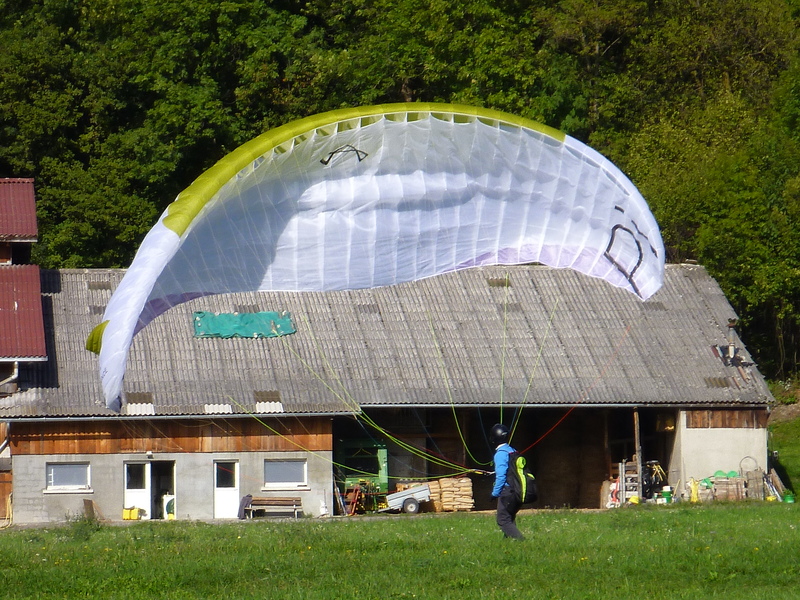 Finally a day off, from the road… and flyable! It has been flyable for the last few days to be honest but we haven’t been able to fly with commitments elsewhere and whatnot. But today, couldn’t have been better for Dennis anyway. There’s still snow on launch but it wasn’t wet, and there were quite a few gliders about. Have to say the conditions did look lovely, and most pilots managed to get a climb out above launch, they weren’t pinging out anywhere though, and it didn’t look as though anyone was above around 1800 meters, as it was quite inverted. But getting above launch is fun enough to reacquaint oneself with the air, especially after a long lay-off. It was nice to see some of the regular faces again too. Dennis just landed! Amazing how I managed to line up the cells with the barn roof! So haven’t been blogging recently, why? just busy is all…. But after having brought through another pilot, this time Simon, the Kenyan Cycling team’s coach… who is now fully fledged with wing and all, and all set to scale new heights in the Rift Valley, and some unexpected Aussie pilots popping by, the odd tandem, and various other commitments, we finally got to fly a couple of brand new demos! And they were lovely! Dennis gave me a call and said, if I get out to the landing field by 3 o’clock, Gavin was bringing out a couple of Pi’s for us to try! So I was out there ready and waiting at 2:45! And yep, we got to try out the all new, brand spanking crisp clean new Advance Pi’s! Other than being a mathematical antiquarian symbol π which is apparently greater than 22/7! but as I’m no mathematician, the sum of this little gliders calculation fitted it’s components description perfectly. The thing with maths, is that the answer is generally always pure, it’s usually right or wrong, and there’s no inbetween, unless one chooses to embark along the routes of equations of infinity, that continually evolve… but now I don’t know what I’m talking about! 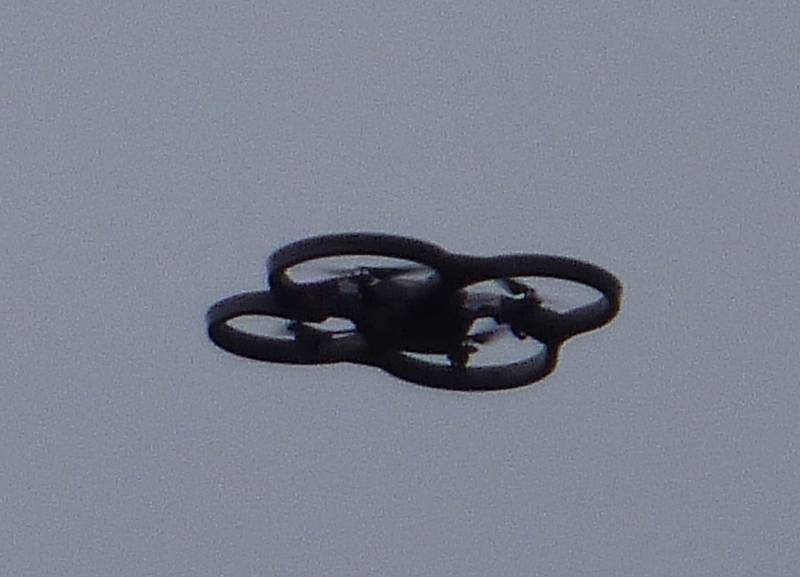 All said and done, the Pi was a real delight to fly. Gorgeous launch characteristics, beautifully light to handle, good solid feel in the air, good to thermal, excellent lightweight harness arrangement with excellent and unexpected back support. For a mountain rig, it held you in the perfect position, and one could fly comfortably for sometime in such a lightweight set-up. For me this little mountain glider, knows exactly what it is!! and the most comfortable one of this type I’ve ever had the pleasure to fly! The whole rig weighed around 3.5-4 kgs, depending on size, and it didn’t feel like I was carrying anything! – Maybe this is the way to go, healthy, happy hikes and flights!! 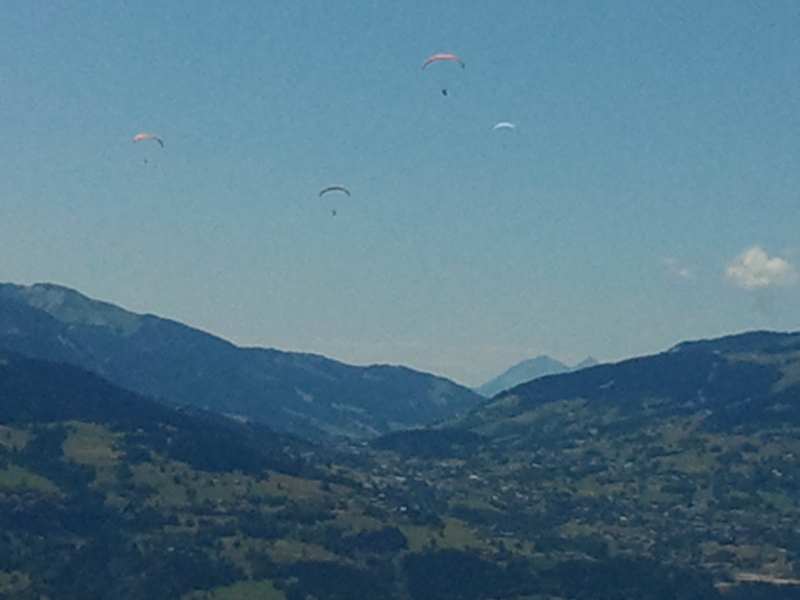 Well we’ve never seen so many pilots swarming ’round Mont Blanc ever! It was the best and most incredible day for top landing the mountain. 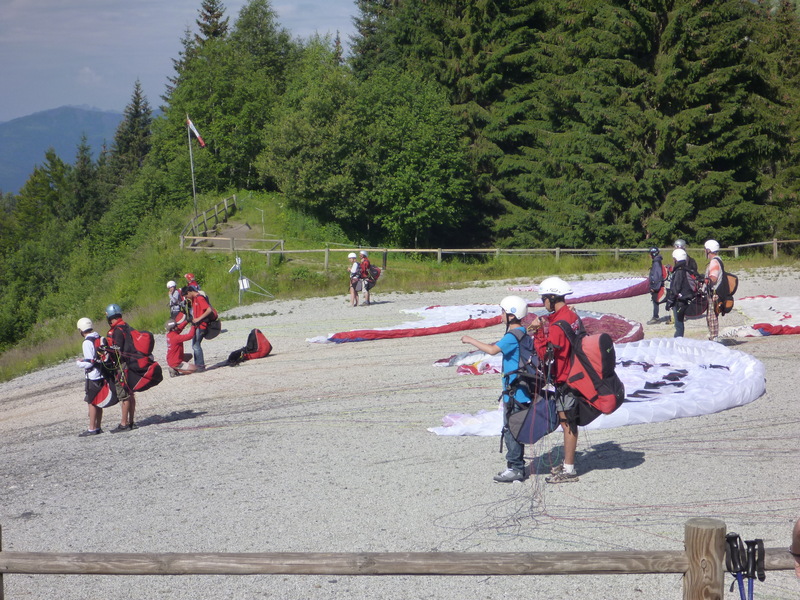 As usual we were grounded with students, but having said that next year the plan is to book out these few weeks in August and do some high Mont Blanc attempts ourselves… me, I was chomping at the bit, and on the verge of handing in my notice! It looked like a start gate gaggle up there! As it happens there has been some controversy over the amount of pilots who totally disregarded the ‘restricted airspace and areas’. The helicopters at this time of the year are really busy keeping the huts replenished and fishing people off the mountain, doing their rescues. 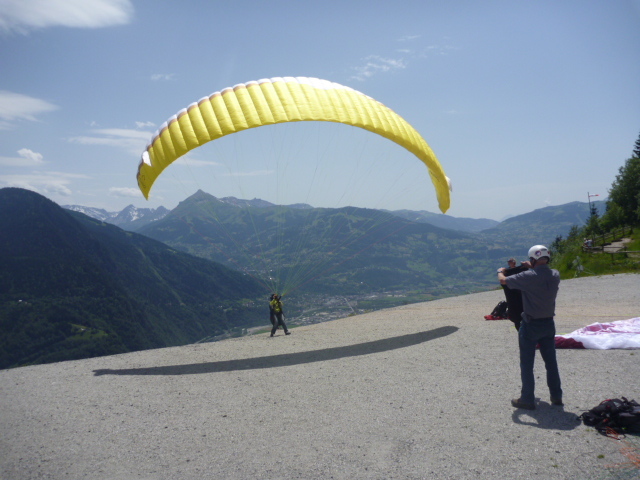 Apparently, they were winching someone off the side of the mountain and were having to contend with paragliders flying underneath and around and about them during a rescue. It seems there may be some slapped wrists over the total disregard of the rules. There were some pilots who did respect the rules and approached the mountain from the correct side. So that’s this years Mt. 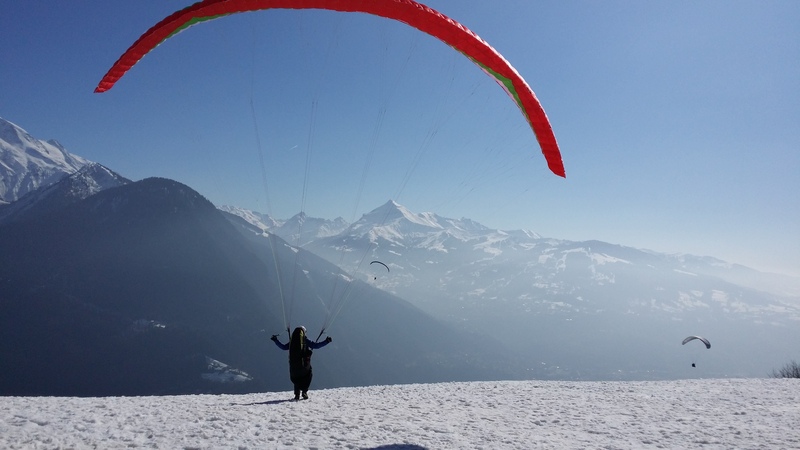 Blanc summit flying over… We wait to see if there is going to be a new ruling considering this in Chamonix now, if the pompiers and helicopter pilots put in official complaints we may be looking at a restriction or a ban…. hope not! On the 20th August, there was another attempt and it was another free for all, with pilots who were not clued up on how to gaggle fly, jumbling up the sky in a mess! It’s a tough one to regulate! As this weather seems to be hotting up even more these days, it seems that the Mont Blanc summit flight may become a bit of a regular thing now… so long as pilots respect the rules! There were many more pilots up there than actually submitted their flights on the logs, maybe it was those that infringed on the restricted airspace that refrained from uploading. Even so… it was a great day, and wish I could’ve been part of it… Enjoy the video pilfered from our local flying club! reminds me of Strawberry Cream chocolate?! 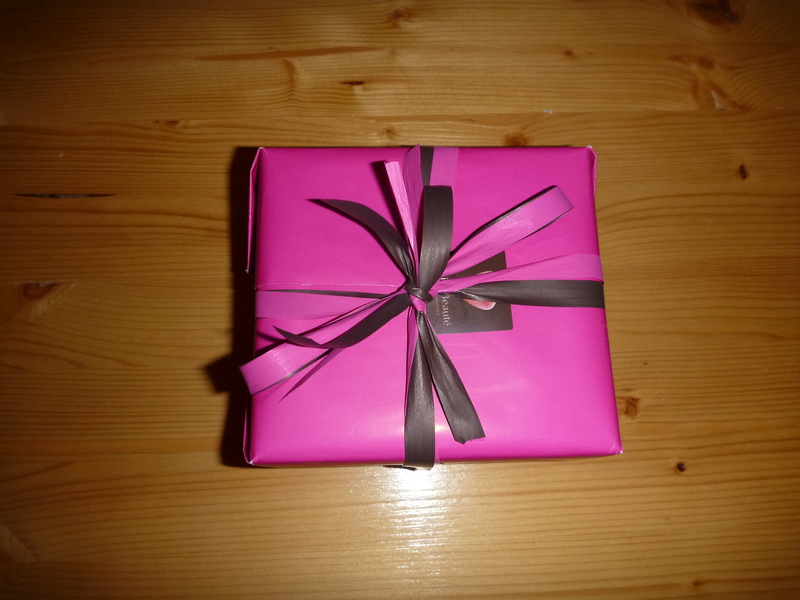 ok… so I haven’t blogged for ages. We’ve been busy! Have got to say, it’s great when our reputation precedes us… as we have had two chaps from New Zealand learn with us a week or so ago, who flew all the way from New Zealand, to learn with us and then fly back again! That’s some compliment… We also had the pleasure of the company of Toby Columbe stay for a while which was great for me, because he relieved me of some work, so I could potter about in the house, but mostly in the kitchen! Toby has a hidden talent in the kitchen also which was revealed… great cook he is! So time has ticked on as it usually does, and I’m pleased to report a new computer which has not glitched or crashed on me at all, can’t believe how smoothly it’s all running, don’t know if I’ve already rattled on about this?! Temperatures have been soaring recently, and the landing field is starting to look like straw, all dried up, but thankfully we had a bit of a shower last night and this morning offering us all some very welcome refreshment. We have another student with us now, who had his first flight today, so was really happy with that. Unfortunately, with all the heat and the moisture it was just far too hoofy to fly him again today, but it’s looking ok for tomorrow. With all this heat, I’ve been getting a bit low on the old perfume, so was greeted with a box of my favourite today… wonder if Dennis is trying to tell me something?! Dell-boy and Aussies in Annecy. So after all the problems with my old Dell ‘boy’ computer, I finally acquired a new HP one instead, and it’s silent and working and hasn’t crashed on me once! It’s great not having the thing seize on me every five minutes. They had a good day in Annecy, even though it started very late. I was surprised to learn that it was quiet, that is such a rarity, Annecy, quiet in July? never! 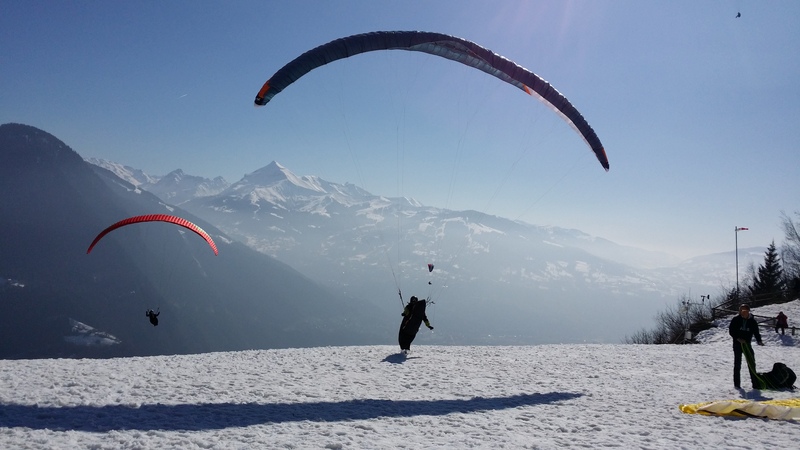 Dennis flew two tandems one early this morning in Plaine Joux with Jordan, Dean’s young son, before going to Annecy, and then flew again later with their grandad so everyone got to have a fly. It was Tandemonium up on launch for most of the day, but we still had Mark with us, working on CP manouvres and honing his launch and landing techniques. The weather has been so far a bit disappointing. It’s flyable but not xc-able due to the rapid weather change and increasing wind speeds. We’ve had a lot of strong upper and mid level winds so far this year, which puts a bit of a lid on any attempts at any epic xc-‘s. It’s been so fickle, but thankfully the conditions have been workable for us, and great for beginners! It was a bit of touch and go, to get off in time before the rain hit, which for me brings on minor recall avoidance, so I just walk away on these occassions! I don’t want another parachutal stall experience being caught in the rain, once is quite enough thank you very much, and no way am I looking for a repeat experience! 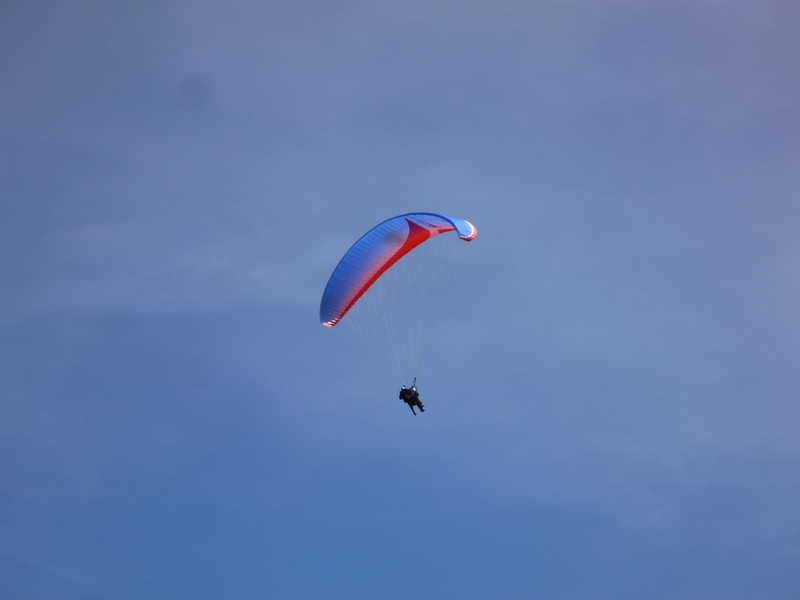 Anyway, the rain held off, until it started… it was approaching from the south-east, Mark had taken off, and practiced some spiral diving, more tandems took off, and Jack the last tandem pilot was waiting on launch as the back-wind switched on and the rain finally arrived. We had already done our about-turn and were on our way down in the shelter of the blue bus, just to catch a glimpse of Jack packing up his wing, very wise! So it was a fast moving day, in getting flights in early before the weather arrived. Mark had three good flights, each one furthering his confidence and ability. Here’s hoping we get some settled weather higher up for a change, for me personally, now that would be nice! Close encounters of the spy kind! Yep, this was my first experience of the mini spy crafts that are ‘silently’ taking over the world to completely eradicate freedoms as we know them! close encounters of the spy kind! 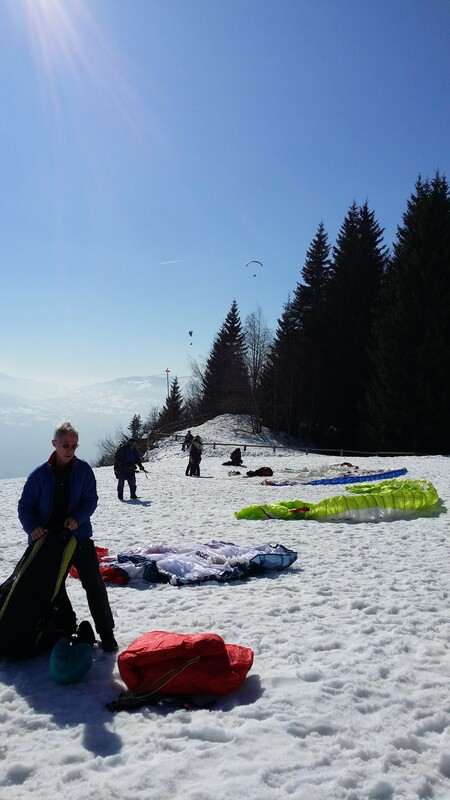 Who’d have thought that Plaine Joux our little para-playground would be one of the targets! It was a very interesting contraption non-the-less but if they want it be effective they’re going to have to do something about that buzzing noise! All the tandems gale hanging! So my desktop computer has finally crashed and burned this time! So the final straw broke the Dell’s back. Sound’s terrible, thinking about the ‘final straw breaking the camels back’ and all, but it is a phrase as old as the hills, or an old Arab proverb to be precise, and it had it’s first referral in the western world in a Dickens novel, apparently, and is in no way a reference to any mishaps any of us may have encountered. It comes to something when we get so worried about ‘offending’ other’s feelings that we can’t speak a sound proverb in a choice moment, for fear of ‘offending’… no wonder there’s a spirit of confusion rife in the world! So anyway, my computer has had it! and I’ve had to upload stuff onto my laptop so there’s been delays. Anyway, enough explanations and onto what’s been happening in these ‘ere parts. The flying has been ‘strong’, conditions yesterday were hairy to say the least! Our client Mark McCabe the airline pilot who is au fait with clouds, weather and all things aeronautical is coming along in leaps and bounds, and will soon be among the ranks of the ‘old man’s sport’ of paragliding, that’s what he called it, that’s what they say about hang gliding isn’t it? seems were catching up! I was getting ready to have a fly, after completing my part of training with Mark, but the wind increased rapidly to the point of it being unsafe, so I didn’t fly. It’s ok as my services are no longer required as Mark can land himself safely now so only one of us is needed, which means that the other is free! yea!!! so that’s me off work for a while, hope the weather’s is going to be good. Yesterday was a great day if you like dodging storm clouds that is! Dennis flew the new Tandem, with our new client Mark a US Airline pilot, who knows a lot about the weather! There were a few other pilots flying, mainly locals who were aware of the conditions and mostly all landed and refrained from stretching the boundaries beyond which mother nature recommends to us flimsy vulnerable cloth captains! But not so, Dennis and his passenger skirting the edges of the ever darkening cloud base, well that’s what it looked like to me anyway! Finally after an hour, and noticing most other pilots had either top landed or were landing in Chedde with an unavoidable vertical descent technique, my common sense summoned me to land. 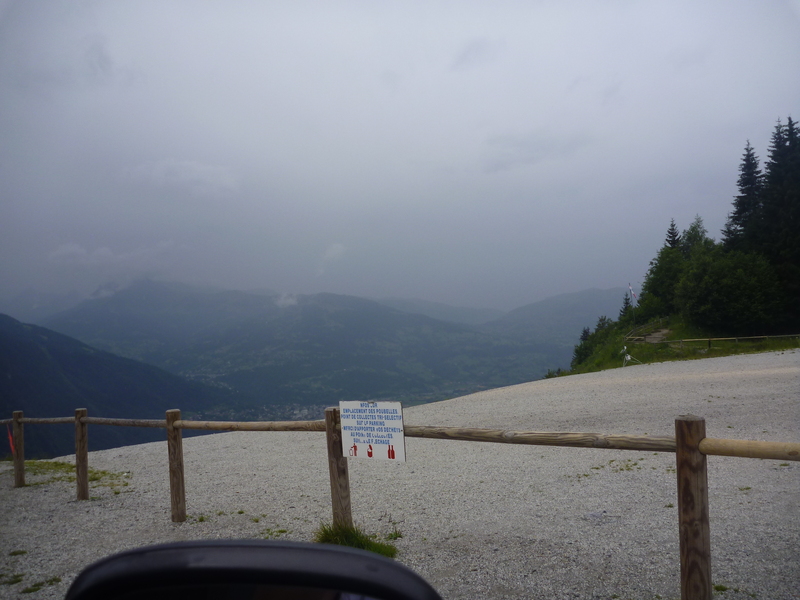 With ever darkening cloud and a scent of it gust fronting, with rain in Les Houches! It was boisterous to say the least and hanging suspended in a stationary position above the church steeple, cables and and farm buildings was enough to bring me down, and I evetually landed on a ballet dancers two step tip toes. So this morning, the majority trapsed up to Chamonix, it was looking windy, so it was not going to be an XC day, as the winds have steadily been increasing. I decided not to go to Chamonix this morning, and would prefer another day when it would be possible to XC without getting thrashed about! so I gave it a miss. Dennis was meeting Gavin down at Bois du Bouchet to take possession of another recent acquisition for the ‘school’ a brand new Advance Alpha 5, – 26. Which I’d be able to fly, although I’d be on the light end as usual. 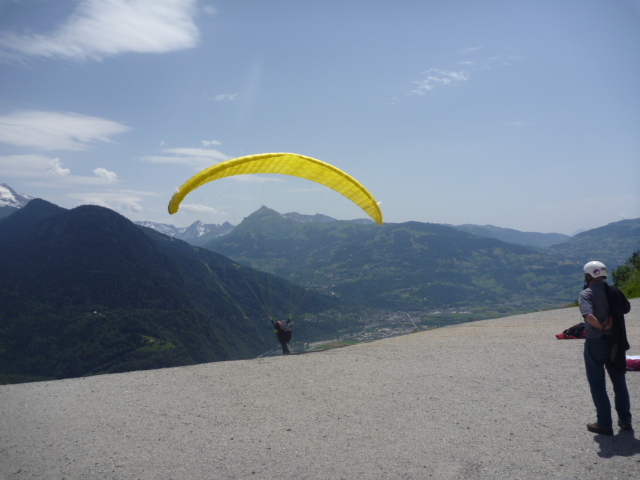 Anyway, Dennis flew it in Chamonix, and had fun on it, so I was on the phone wondering what was taking them so long to come down here to meet me at Chedde, so I could give it a go.